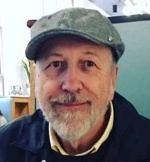 Posted on April 30, 2018 by Robert Tuomi wrote in Arts and Culture. It has 0 Comment. On any given day Walkerville’s Biblioasis bookshop is chock full of books. On May 4 the little shop will also be filled to the brim with published writers. 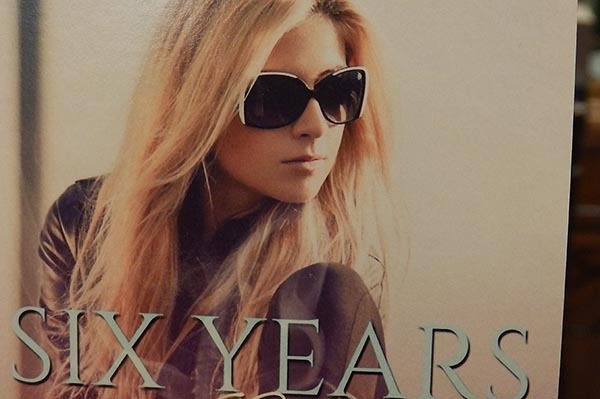 Starting at 7pm, it will host one of the largest reading events in the fiercely independent publisher and retailer’s 20 year history. What is common among the five novelists, says bookseller Dave Fine, is their self-reliance. These wordsmiths independently publish their books. The number of such beings locally, Fine tells Eyes on Windsor, might well be a surprise. 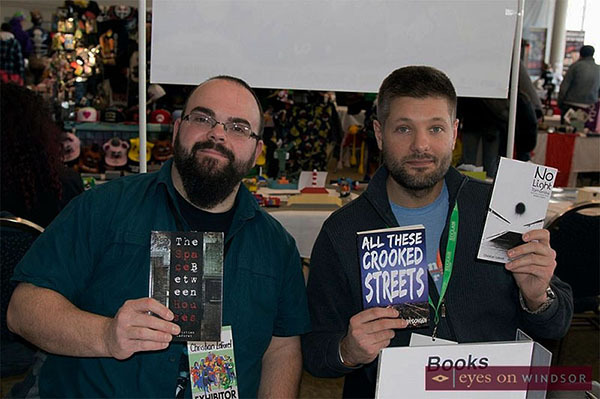 Local authors Christian Laforet (left) and Ben Van Dongen (right) hold up novels they have written including All These Crooked Streets. Photo by Eric Bonnici / Eyes On Windsor. Apparently, the city is full of scribblers, more than might be expected in a city of Windsor’s size. Their output ranges from fiction to reality and about everything else in between. Events like this bring them out into the open, which is both good for the authors – in this case four from Windsor and one from Hamilton – and readers seeking new adventures. 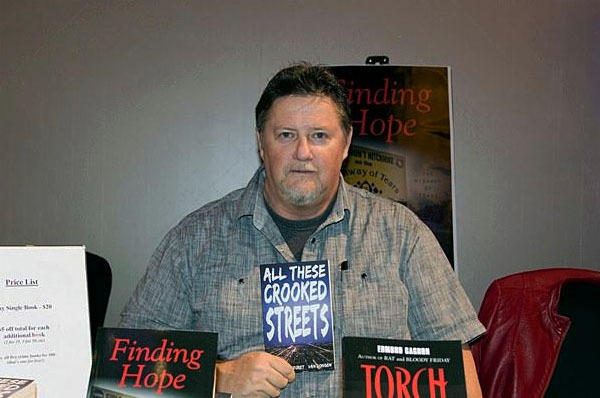 Local author Edmond Gagnon holding up a copy of All These Crooked Streets. Photo by Eric Bonnici / Eyes On Windsor. 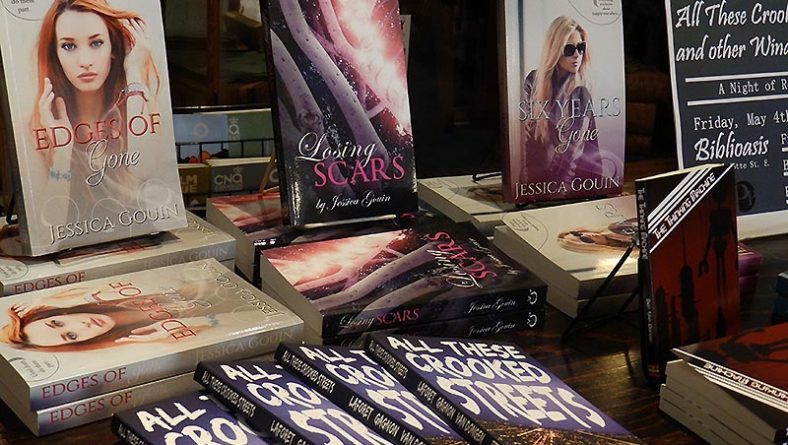 Biblioasis has named the event, “All These Crooked Streets and Other Winding Roads,” to honour bad decisions, poor choices and the inability of some to resist easy money. These are the premises of three separate fictional tales contained in All These Crooked Streets, one of the evening’s featured books. In this compendium, local writers Christian Laforet, Edmond Gagnon and Ben Van Dongen, “shine a spotlight on the seedy underworld hiding around the corner…in the shadows,” where it is easy to become lost. 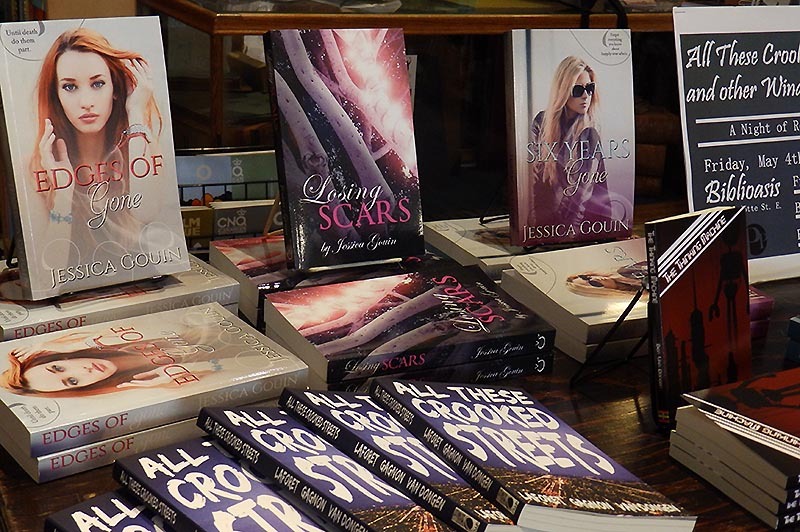 Jessica Gouin, author of Six Years Gone, is one of five authors featured at the May 4 Biblioasis event. Photo by Robert Tuomi / Eyes On Windsor. In The Captain of Kinnoull Hill, from Palimpsest Press, Steel City first-time author, Jamie Tennant, tells the puzzling mystery of Dennis Duckworth. This very non-likeable member of Chicago’s music scene stumbles into trouble in the wooded hills of rural Scotland. There is something intriguing about the five writers. According to Fine, they are all somehow connected. The exact nature of these links should prove fodder for hearty conversations.